Max Stiner (1806-1856) was the philosopher of conscious egoism. 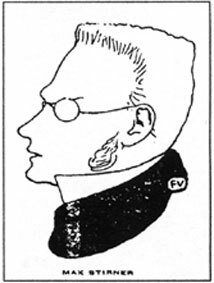 His book Der Einzige und sein Eigenthum (1844; published in English as The Ego and His Own, 1907) is the fundamental work of that philosophy and the philosophical basis of individualist anarchism. The German poet and anarchist writer John Henry Mackay carefully researched Stimer's life and published his biography in 1 897, with a third, definitive edition in 1914. This is the first translation into English.